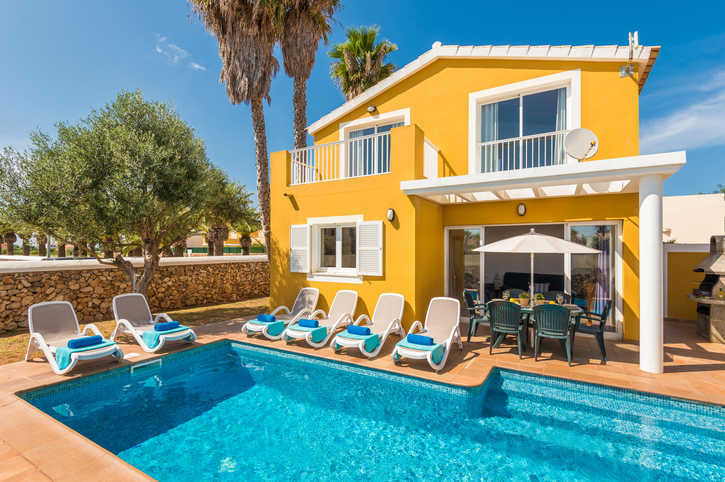 Villa Benjamin is a 3 bedroom villa in the attractive resort of Sa Caleta on the West coast of Menorca. The location is perfect, with the picturesque cove with crystal clear waters just 10 minutes' walk away. The islands historic old capital Ciutadella is just 5 minutes' drive north with an abundance of shops, bars and restaurants. This bright and spacious property has an inviting private pool and garden - perfect for soaking up some vitamin D. Wifi and Air conditioning/heating is included in the bedrooms and lounge. What a great location within walking distance of charming Sa Caleta cove plus just a short drive from Santandria with a choice of places to dine. A private swimming pool is surrounded by sun loungers where you can spend lazy days and relax with a good book. Palm and olive trees dotted around the garden provide areas of shade. Why not cook up some tasty meals on the BBQ to be enjoyed in the alfresco dining area? There is on-road parking with enough space for a couple of hire cars. The gated villa entrance is to one side of the property and leads through the garden with 1 step up to the front door. There is a sociable open plan dining area and lounge with comfortable sofas, a TV and dining table and chairs. Patio doors leading to the pool terrace keep the brightly decorated living area well-lit. A breakfast bar separates the wooden furnished well equipped kitchen from the lounge. There is a washing machine in a cupboard accessed from the outside of the villa. A twin bedroom decorated in light pastel colours is on the ground floor with access to a separate bathroom. On the first floor, there is another spacious twin bedroom with a Juliet balcony looking out to the pool. The generously sized double bedroom has its own private balcony with table and chairs overlooking the pool terrace - just imagine relaxing with a glass of wine while watching the sunset. Villa Benjamin is a detached property just 5 minutes' walk from Sa Caleta's golden sandy beach. A little further down the coast is the scenic Santandria with its waterside cafes overlooking a pretty bay. The popular resorts of Cala Blanca and Calan Bosch are both a 10 minute drive away, with wonderful beaches and a great selection of restaurants that keep holiday makers returning year after year. The islands old capital Ciutadella is just a 5 minute drive north, offering an abundance of culture, shops, bars and a pretty harbour. Our villa Samuel is 2 doors away, perfect for larger groups requiring seperate accomodation. There is a small mini market approximately 5 minutes' walk from Villa Benjamin, perfect for topping up on daily essentials. Alternatively, there is a larger supermarket on the outskirts of the resort, a short drive away. For a wider selection, Ciutadella has clothing, craft and ceramic shops as well as a local food market and a night market in the town centre. Shop till you drop in the capital, Mahon, with all its chic boutique and artisan shops a 50 minute drive away. For authentic Spanish food, head to Ciutadella and enjoy tapas and sea food from one of the restaurants overlooking the harbour. Embrace the Spanish way of life and explore the quaint coffee shops dotted around Ciutadella main street and side alleys. Cala Blanca is where you'll find the most evening entertainment, and an array of bars and restaurants, some overlooking the beach - perfect for a light lunch but also popular when the sun goes down. Sa Caleta cove is a 10 minute walk from the villa and is accessed via steps down to the sand. It has a beach bar in the high season, ideal for a refreshing drink or ice cream! 15 minutes' walk takes you to Playa Grande beach by Ciutadella. 10 minutes' drive south along the coast is the larger Cala Santandria Bay, a popular snorkelling location thanks to the rocky headland and water sports on offer. Cala Blanca beach,10 minutes' drive away, is a family favourite with calm waters and water chutes available for hire. This beach is also flanked by several large cafes, bars and restaurants meaning you can relax on the beach all day long. If you're looking for more adrenaline, then head to one of the island's two waterparks, Aquacentre in Calan Forcat, 15 minutes' drive away, and Aquarock in Calan Bosch. Children will love the popular Lloc de Menorca Zoo, close to Alaior 30 minutes' drive away, with plenty of native as well as exotic species of fauna. Drive 40 minutes' inland to the highest point in Menorca, Monte Toro, which offers panoramic views over the whole island, a gift shop and coffee shop with delicious local pastries for sale, plus an opportunity to visit the church atop the hillside. The scenery on the drive up to the peak alone makes the journey worthwhile. Menorca has a fabulous walking and cycling route called the Cami de Cavalls, an old bridle path which circumnavigates the whole of the island. Don't forget your camera to capture the stunning coastal views. Castillo Menorca, along the main road towards Alaior, also makes for a great day out with an adventure and waterpark, go-karting track and large retail outlet with a restaurant, 15 minutes' drive away. Villa Benjamin is not available to book for season as it is sold out. Take a look here at the Menorca villas that are currently on sale.